On Monday, January 28, Westwood Drive between 22nd Avenue and the Highway 97 on and off ramp will be closed in both directions. The closure is to allow crews to carry out work related to upcoming changes to the signal operation at the Highway 97-22nd Avenue intersection. This section of Westwood Drive will remain fully closed for a few days while operations are carried out including the installation of concrete barriers and signage. Following these operations, Westwood Drive will be reopened to southbound traffic while the northbound lane will remain closed permanently. Access to Highway 97 northbound is available from the on-ramp east of the overpass on Massey Drive. In June 2018, CNC student Sandeep Kaur was killed north of the Highway 97-22nd Avenue intersection in front of the College of New Caledonia. The location was commonly used to connect CNC and the residential area east of Central Street East. The removal of a walkway from the CNC campus to a decommissioned bus stop across the highway. On-campus signage to direct pedestrians to the Highway 97-22nd Avenue intersection. Installation of a concrete barrier on the west side of Central Street East at 20th Avenue with signs to direct pedestrians to the Highway 97-22nd Avenue intersection. The construction of sidewalk on Central Street East from 20th Avenue to 22nd Avenue. Installation of a fence along the Highway 97 median from 22nd Avenue to 18th Avenue. The remaining work being undertaken by MoTI involves a change to the signal operation at the Highway 97-22nd Avenue intersection. The signal sequence will include a dedicated left turn movement for 22nd Avenue traffic. The pedestrian crosswalk signal will improve the safety of pedestrians using the intersection. A countdown feature will also be added to the pedestrian signals. The signal operation change requires that northbound traffic from Westwood Drive be prohibited from entering 22nd Avenue from Westwood. 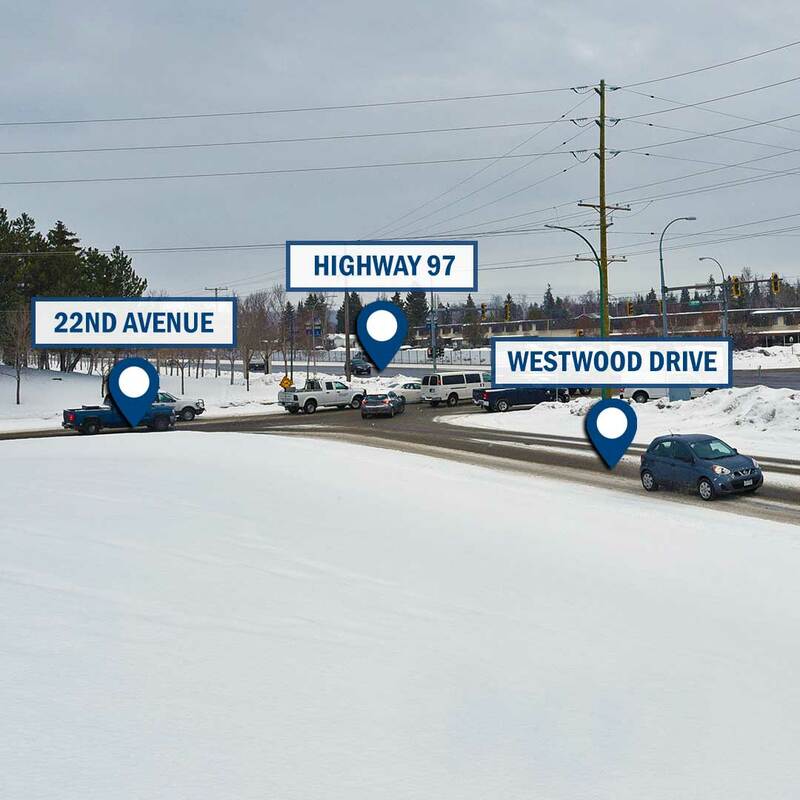 Alternate access to Highway 97 northbound is available from the on-ramp east of the overpass on Massey Drive, 550m east of the Westwood Drive-Massey Drive intersection.